Earlier this month, Maria Santos Gorrostieta, a former small-town mayor in the drug-trafficking western state of Michoacan in Mexico, was reportedly kidnapped in broad daylight in front of her young daughter. A few days later, her body was found by the side of a road in the southern part of the state. It is believed that the woman was tortured before she was killed, the Los Angeles Times reports. Gorrostieta had previously survived two assassination attempts, the LA times adds. The first, in 2009, had claimed the life of her husband, Jose Sanchez, another former mayor of the town; while the second, three months later, had left her badly wounded. Gorrostieta had been mayor of Tiquicheo, a remote town in the so-called hotlands of Michoacan, farmland firmly under the thumb of drug-trafficking cartels. She had denounced traffickers; she also had to confront accusations that her late husband was involved in criminal business. Gorrostieta, whose mayoral term ended in 2011, reportedly knew that her life was constantly in danger. Yet, even after her husband was murdered and the second attempt on her life left her riddled with bullets and "in constant pain," Gorrostieta refused to give in, the Christian Post notes. "I have had to bear losses that I would not wish on anyone, and have had to accept them with resignation and with the knowledge that it is our Lord's will, and have gone on, even with a wounded soul," she once said, according to the Christian Post. "Despite that, and despite my own safety and that of my family, what occupies my mind is my responsibility towards my people: the children, the women, the elderly and the men who break their souls every day without rest to find a piece of bread for their children," she continued. "I will get up however many times God allows me to, to keep on searching, scratching, negotiating plans, projects and actions for the benefit of all of society, but in particular, for the vulnerable ones. This is who I am." Hailed by some as the "heroine of Mexico," Gorrostieta was reportedly abducted on Nov. 12. The Daily Mail, citing Mexican newspaper El Universal, reports that the 36-year-old was "ambushed by a car" as she was driving her daughter to school in the city of Morelia, located in the north central part of the state of Michoacan. She was allegedly "hauled from her vehicle and physically assaulted as horrified witnesses watched," the news website reports. She is also said to have "begged for her child to be left alone" before entering her abductors' car "willingly." The woman's body was finally found later that week in another part of the state. According to local media, Gorrostieta had suffered wounds on her knees and two apparently fatal blows to the back of the neck. She also bore marks indicating she had been handcuffed. Authorities did not indicate any possible suspects in the homicide, but said it was likely the work of organized crime. Michoacan's forests and mountains are "used by drug traffickers to grow marijuana and produce synthetic drugs," according to EFE. Several drug gangs, including the prominent La Familia Michoacana, have been active in the region. 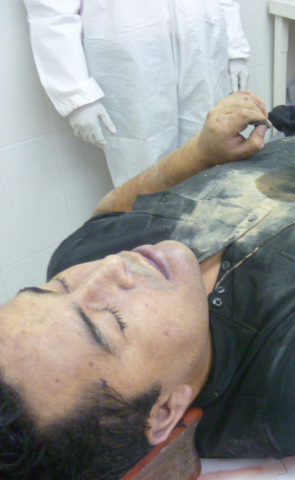 According to the BBC, about "two dozen mayors have been murdered since President Felipe Calderon declared war on drug traffickers six years ago."